The practice of meditation can be described as a journey back home, back to our native land, as Paramhansa Yogananda called it. As we practice meditation, we find that the journey is not always easy. 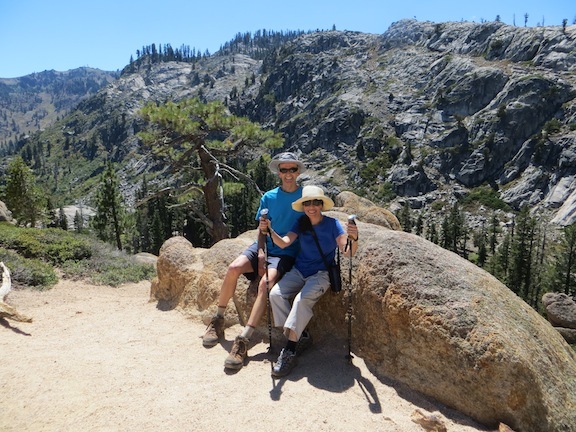 At the end of summer 2014, my husband and I went to Squaw Valley in California, to relax in nature. Each day we went hiking in a different place. On the third day, we found a trail 10 minutes from where we stayed. There was no sign at the beginning indicating the length of the trail. We started at 6,600 feet elevation, and most of the way was uphill. I had no idea how far and how high we were about to climb. As we started to climb, I found that I couldn’t walk fast, like I normally do, as I wasn’t getting enough oxygen. I had to adjust the pace according to my body’s physical needs. Even though the hike was not easy, by using spiritual tools I was able to embrace and savor every step along the way. After three hours of uphill climbing, we reached the top, where we discovered some magnificent lakes. Later I learned t hat we climbed the Five Lakes Trail at Granite Chief Wilderness, from 6,600 to 7,500 feet. 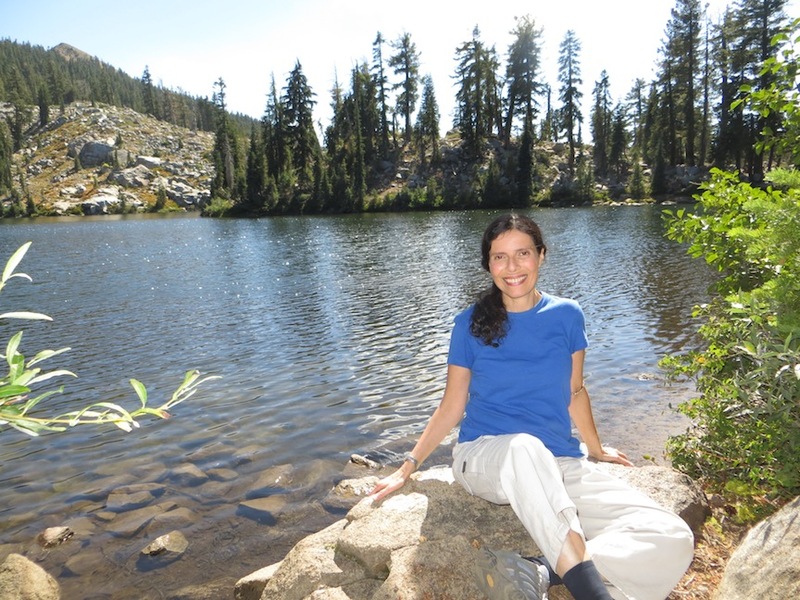 This hike was a wonderful lesson for me, and a metaphor for the spiritual journey. As we embark on our spiritual journey, we don’t really know how long it will take us to reach our destination. 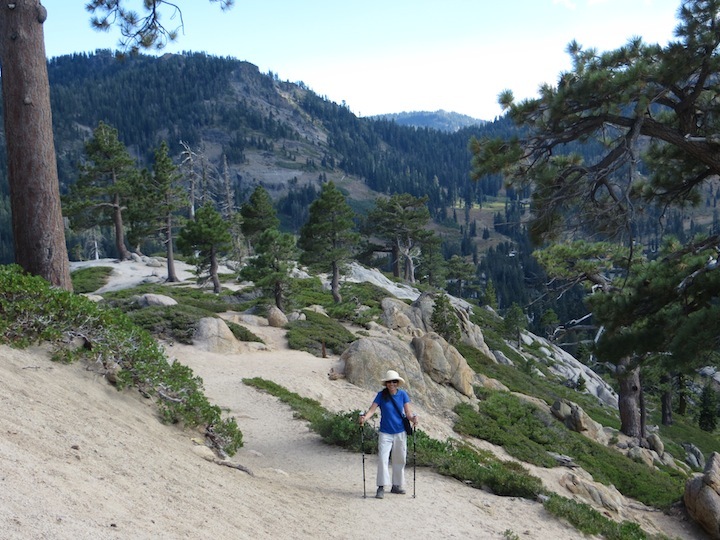 We can use “spiritual hiking poles” in our meditation practice: repetition of a mantra or an affirmation, chanting, use of visualization, and breathing techniques. All the spiritual practices help us to keep moving up, and avoid sliding down. We can’t make a leap to the top, but if we keep putting out energy to move upward, with steady effort, we begin to feel lighter, freer, and more joyful along the way. The more we savor each step along the way, with its ups and down, enjoying the process—not pushing it away, rejecting it, or wishing it to be different than it is—the more we can enjoy the journey and the more likely we’ll reach our destination. Let’s enjoy the journey back home, and embrace whatever comes along the way. You can reflect on your “hiking poles,” which help you along your journey back home. Re-energize and use them during your meditation practice and all along your spiritual journey. This entry was posted in Meditation Teacher Training. Bookmark the permalink. Thank you for this beautiful post. I was in great need of hearing God’s truth and not my misguided perception.